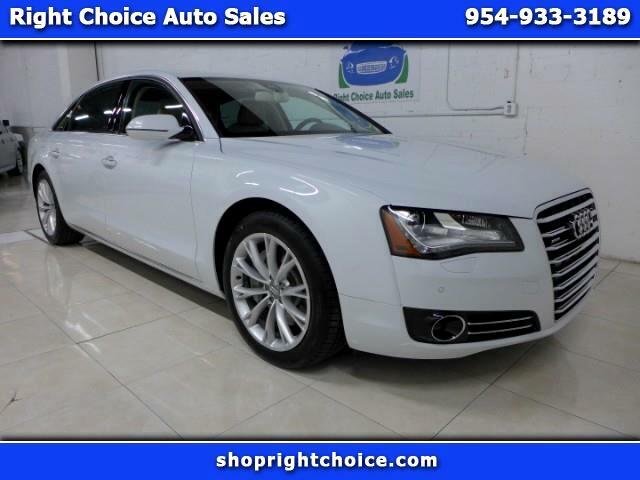 WE CAN DELIVER THIS 2013 AUDI A8 L TO ANY DRIVEWAY IN THE COUNTRY! VISIT OUR WEBSITE AT WWW.SHOPRIGHTCHOICE.COM TO SEE 90 PHOTOS, THE FREE CARFAX, AND MORE INFO ON THIS SPECTACULAR DEAL! THIS A8 L QUATTRO IS LITERALLY LIKE NEW AND HAS BEEN AUDI CERTIFIED SO YOU GET A 1 YEAR, UNLIMITED MILEAGE BUMPER TO BUMPER WARRANTY! WE'VE PRICED IT $4,470 BELOW THE CARFAX VALUE TO MAKE IT THE BEST DEAL IN THE COUNTRY! DON'T MISS THIS ONE.